This page was created 3/29/14, so it's a bit of an experiment! A few brave souls have volunteered to send me pictures of their shacks, featuring TMC equipment. 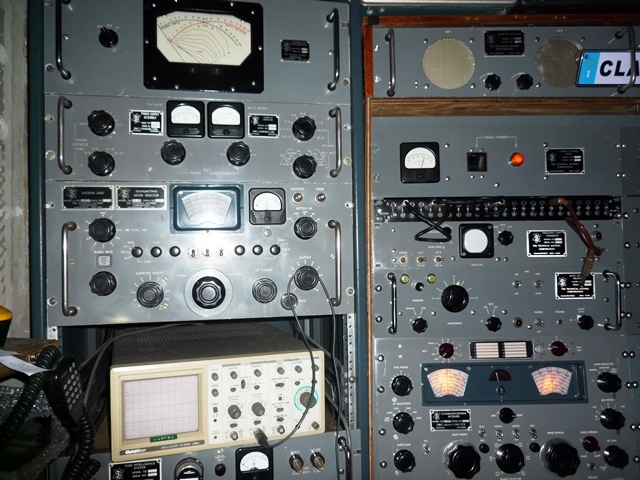 I always love visiting someone else's shack, and it's interesting to see how this 60-70-year old equipment has been lovingly restored and used! If you'd be willing to add yourself to this list, send me photos, videos, and a paragraph or two about your shack, restoration experiences, how you got into collecting TMC, and anything else interesting, and I'll post it! Note that some are reluctant to post photos of their shacks, and probably with good reason. You're basically advertising what you have in your house/outbuildings, and thereby possibly inviting a thief to visit. To avoid this issue, I'll could post ONLY your callsign, not your name and location, or make the posting completely anonymous.. that makes it a little more difficult to locate you. 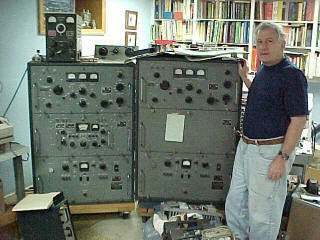 Many TMC collectors know Tony Faiola K3WX (formerly W2GBS).. He was a TMC employee during the company's heyday (1954-1962), holding many jobs there. 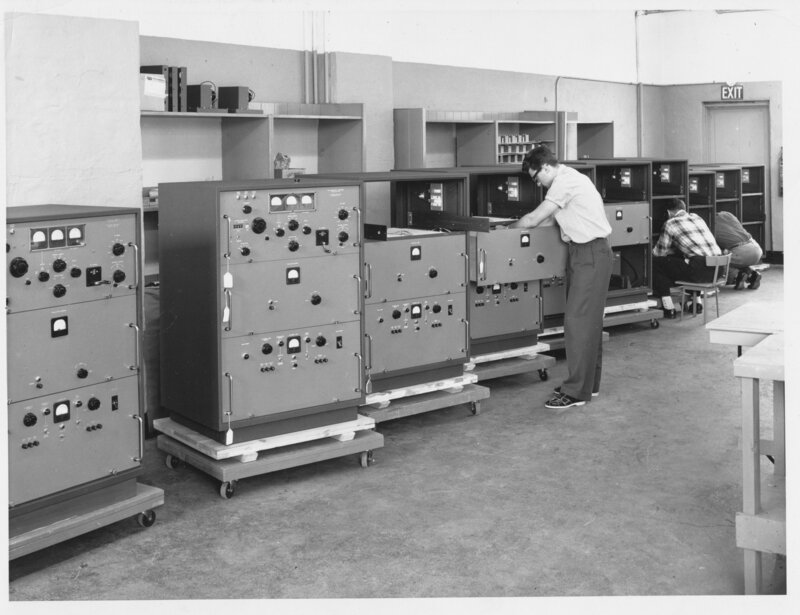 The photo below from the TMC archive shows a young Tony working on the GPT-750 production line. 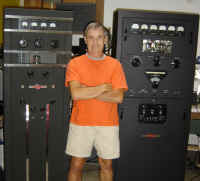 In this photo, to my right are two models of the GPT-750 D2 (SSB) AN/URT-17A and the GPT-750(A) (CW only). 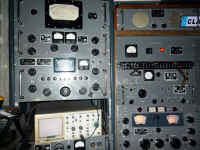 On top of the SSB version, is the Model TAC- Antenna Tuner. A number of years since this photo was taken, the SSB version went to Robert McClain, K4ATS. The other GPT-750 I have retained and operated to date (2017) for the past approximately 30 years with basically very few problems. This was using an external Yaesu transceiver (with attenuators in the transmitter output) and the alternate TMC external SBE-2. In this photo, is the XFK version of the GPT-750(C) or(D3). A number of years since this photo was taken, this model went to Bruce Berman, W2XR. Bruce went through extensive restoration and modification to his unit. Although I have never owned the GPT-750(B) AM version, many, well over 100 were final tested and approved for shipment by me to a number of commercial and government agencies such as the CIA, FAA, NASA, China, etc. 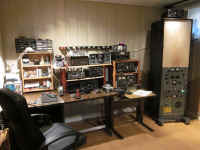 In this photo, you will note in the backround, a number of TMC and other products in the rack and more in my other shack locations. I will follow up with some photos and comments concerning them. I had posted a few questions regarding my then newly acquired 'dead and cold' PAL-1k - almost 2 years back. Well, I brought it back to it's old glory (in its present form) 3 months since posting my query. It was put aside (moved, rather) because of other priorities. Last week I re-commissioned it, and it is working very well. An easy 1kW with about 15W drive from my FT-ONE. I have the Eimac 8295A, and the i/p was swamped with a 50R DL by the previous owner (no pre/driver). I'll soon post some detailed PICs of the entire process of repair activity. 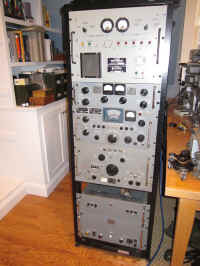 Here's a picture of my PAl-1k: (above) Yes, no exciter; half the original rack is empty. At one point I had decided to give it away, but that has now changed. It's a keeper. I'm currently looking at ALL possibilities of reducing the blower noise - even it it comes to lower CFM - because, when we don't really operate at full power key-down (or AM/FM), why do we need so much cooling ? tube. Any thoughts, please ? Claudio, LU5FBX, is a very active collector who lives in Argentina. Where he turns up all of these exotic radios is a mystery, but he does! Below is a gallery of photos he sent me a while back, only a small portion of his collection. LU5FBX's operating position is shown to the left. Fantastico! To the right are a couple of shots of Claudio's PAL-350 and GPR-90RX along with some auxiliary equipment. ...is a serious collector and newbie restorer. 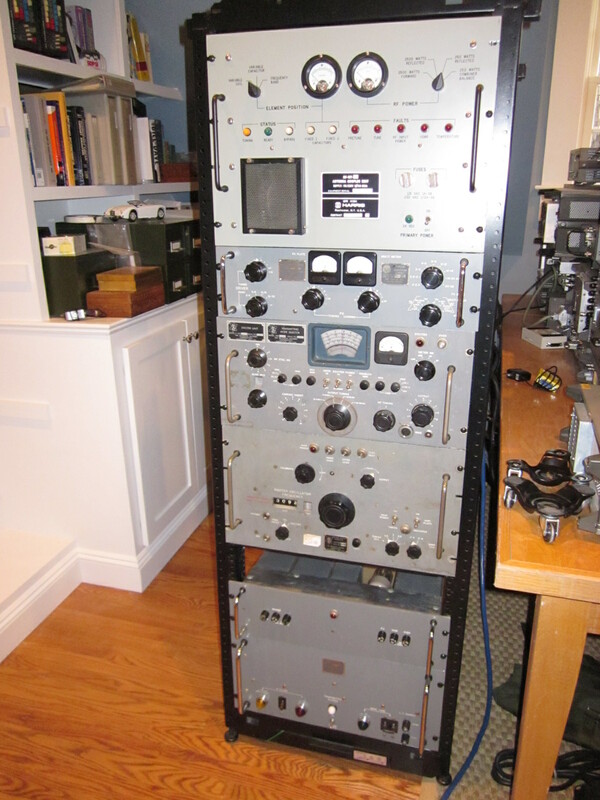 He acquired one of the three PAL-500's that I rebuilt, and then proceeded to find some additional parts (a VOX and an SBE) to build a complete transmitter. He's about to tackle the SBE rebuild, and will report in with his experiences as he goes along. Nick, K4NYW, is my "elmer" and is ultimately responsible for dragging me into this madness back in 1996. 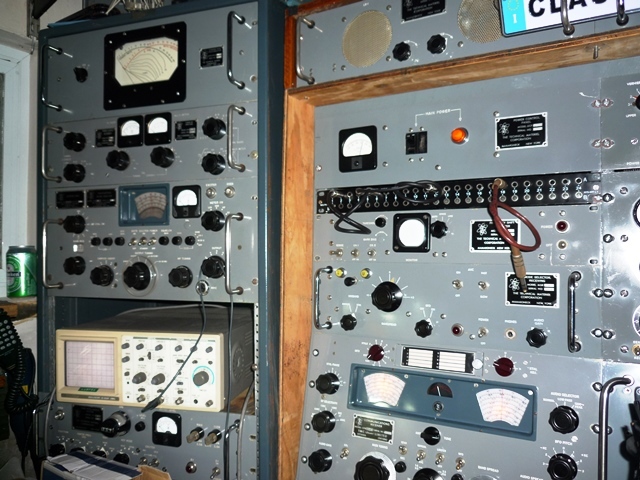 He and I have been on many amusing radio adventures, many of which resulted in fetching large, heavy, gray Navy radios from far-flung points back to NAVCOMSTA Kenmore in Chapel Hill, NC. 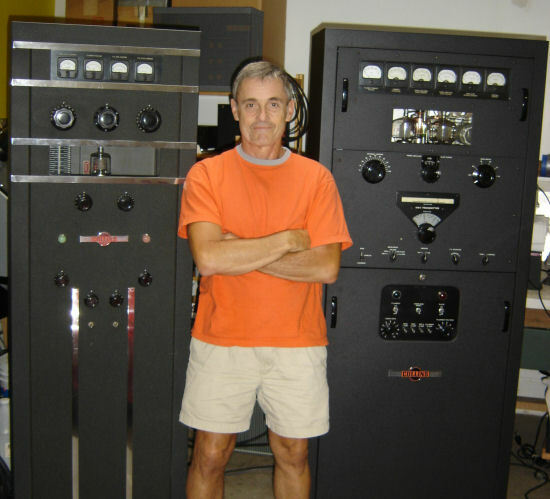 Nick has two large TMC rigs, an SBT-1K (unsynthesized, with SBE-3, VOX, on the air on a regular basis) and a DDR-5 (about half-way restored at this point, but working to some extent). To the left is Nick's DDR-5, actually an FRR-60 that we hauled back from the estate of my good friend, and inveterate TMC collector, Brent Bailey some years ago. See Unloading the FRR-6 for the saga of the UN-loading. We had the help of several strong youngsters at the other end to help with loading! This rig is also featured on the front page of this site, with Nick's cat Murphy lurking inside. 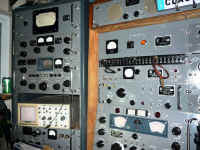 This is Nick's SBT-1K back when it was still under restoration. 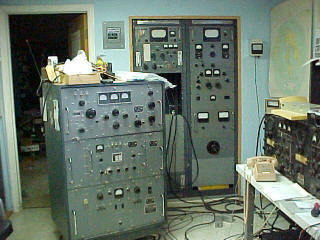 It is regularly in service these days on both AM and SSB. It has been joined by the bits and pieces of an SBG-1 synthesized exciter, but that's going to be a major project to get going! 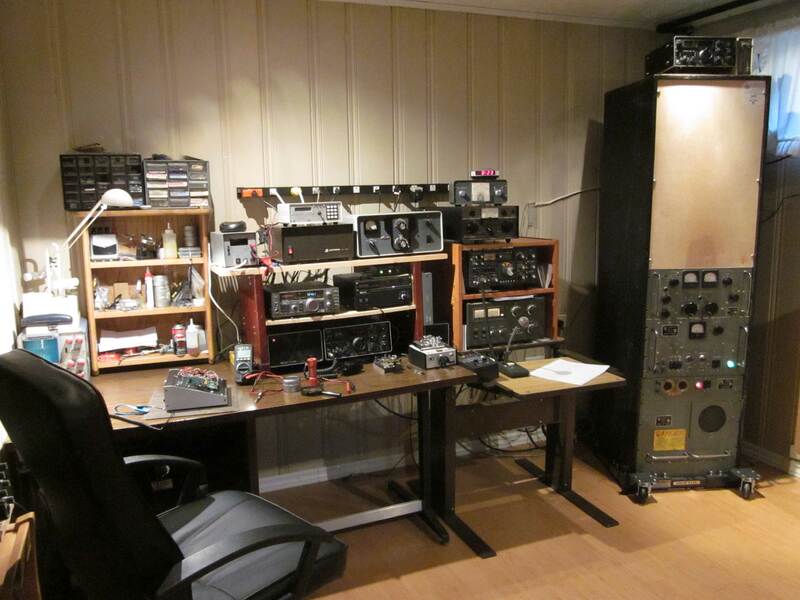 To the right of the SBT-1K is Nick's URT-3, a thing of amazement and beauty, also now working.